Continued river level rises are expected in the Flood Watch area over the next few days. The monsoon trough extends across Cape York Peninsula to a Tropical Low situated in the northwest Coral Sea east of Cairns, and is expected to continue to slowly move northwards and remain active over the region through the weekend. Some of the catchments in the Flood Watch area are currently flooding or have experienced flooding in the past week. Rivers and streams in these areas will respond faster to further rainfall. 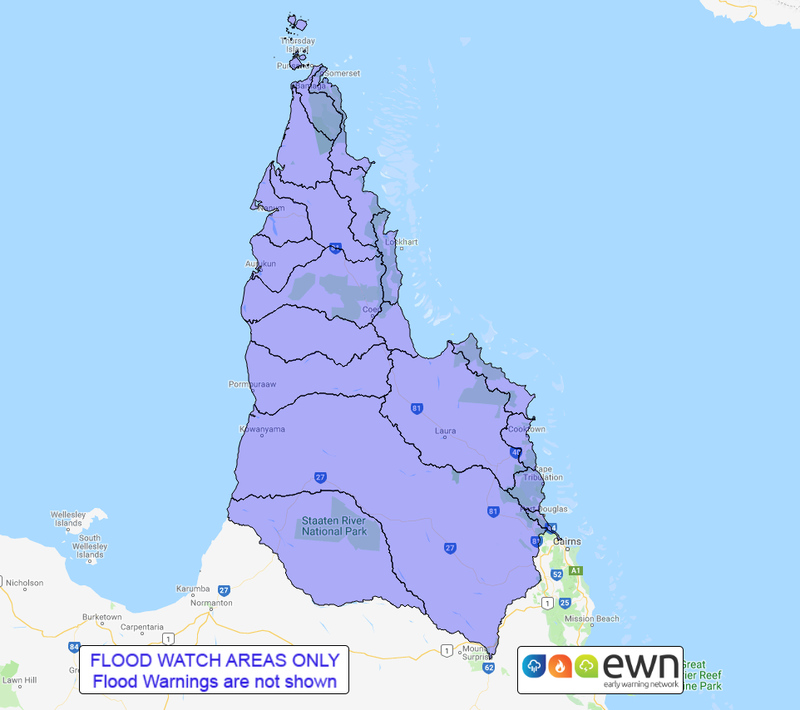 Scattered slow moving thunderstorms are forecast to continue across the Flood Watch area through the weekend, with locally heavy rainfall (50-100 mm) at times likely in the Cape York catchments north of a line between Kowanyama and Port Douglas. Heavy rainfall may also lead to flash flooding across the Flood Watch area. Flood Warnings remain current for numerous other catchments across the State. See www.bom.gov.au/qld/warnings to view the current flood warnings for Queensland. The next Flood Watch will be issued by 01:00 pm EST on Sunday 10 February 2019.